Hi, ladies! Welcome to the Holiday Photo Card Blog Hop! It’s Flóra here, and we are excited to be part of this super fun blog hop. If you came from the amazing Kelly Griglione’s blog, you are right on track! Today I’m sharing an elegant Christmas card that incorporates a personal photo. 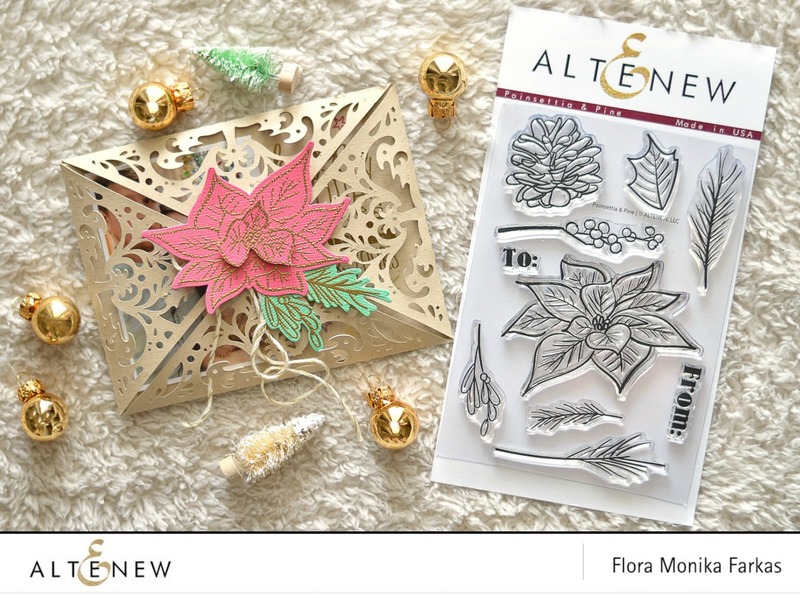 To create this card I used the Altenew Festive Silhouettes Stamp Set and the Poinsettia & Pine Stamp Set. First of all, I cut out this beautiful, elegant envelope out of craft cardstock using a cut file. Then I created the poinsettia and branch die cuts with Altenew Poinsettia & Pine Stamp & Die, using gold heat embossing technique. I stamped the image on colorful cardstock as I am not so good at watercoloring. Next step was to make the insert with the sentiment and personal photo. 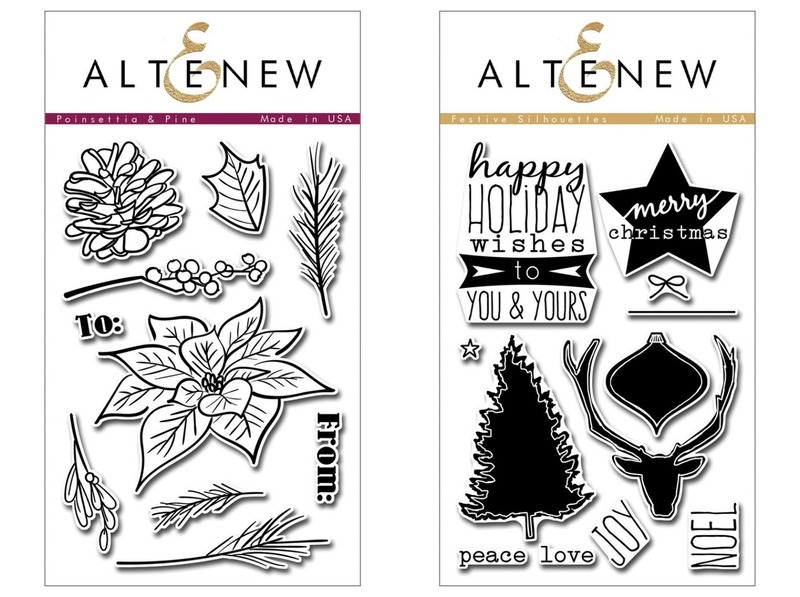 The holiday wishes were made with Altenew Festive Silhouettes Stamp Set. I chose again the gold heat embossing technique as this is the best way to make something festive and elegant. In the end, I added tiny colorful stars which are coordinate with the Christmas tree decoration in the background of the photo. I also created a process video, so you can see better how I made this easy but unique Christmas card. You can watch my video here or in HD at Youtube. I hope you like my project! Winners will be selected at random from the comments left on each blog hop stop. Be sure to leave a comment on each stop to increase your chances to win! Leave your comments by Tuesday, November 22, 2016, 11:59 pm CT. Seven winners will be announced on LiveLoveCards on Wednesday, November 23rd, just in time for Black Friday. Your next stop on the hop is the lovely Cassie Tezak! Stamp Focus : Moments in Time – Video! OMG!!! Very, very beautiful card. What an elegant card!! Love the combo colors!! Such a lovely, elegant card! Such a pretty lacy cut, perfectly embellished with that poinsettia! Great job. Card and matching fancy envelope. Love it. Gorgeous card! I love the cut file you used – that lacy look is lovely. The soft colors you chose, too, are beautiful. Oh what a gorgeous card and envelope! All your friends and family will treasure these! So pretty, love the intricate look of this and the pink and gold together. BEAUTIFUL photo and photo card, DELIGHTFUL embellished envelope too!!! 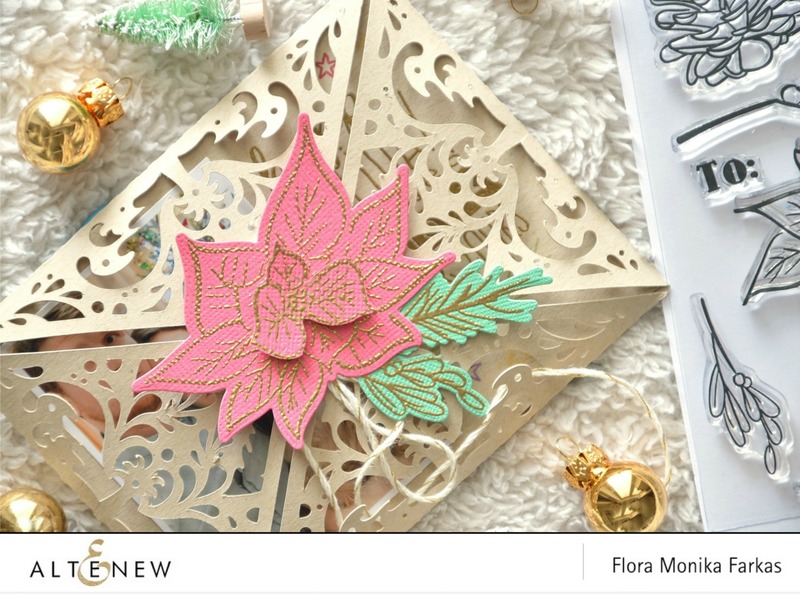 WOW – this is such a WONDERFUL Christmas card Flora, LOVE the design and really appreciate your video showing how quick and easy it can be to assemble!!! The poinsettia on the front is really striking. Great idea. A beautiful photo card! Thanks for the inspiration and chance to win. This is such an elegant and lovely card! It complements your photo beautifully! Wow! This photo card is so pretty! Love cards that allow you to keep the photos. Nice work! So very elegant and stunning. Makes me feel the reason for the season. The card just warms my heart. It is colorful but simple looking. Lovely presentation! The recipient will know it is special. Such a stunning card! 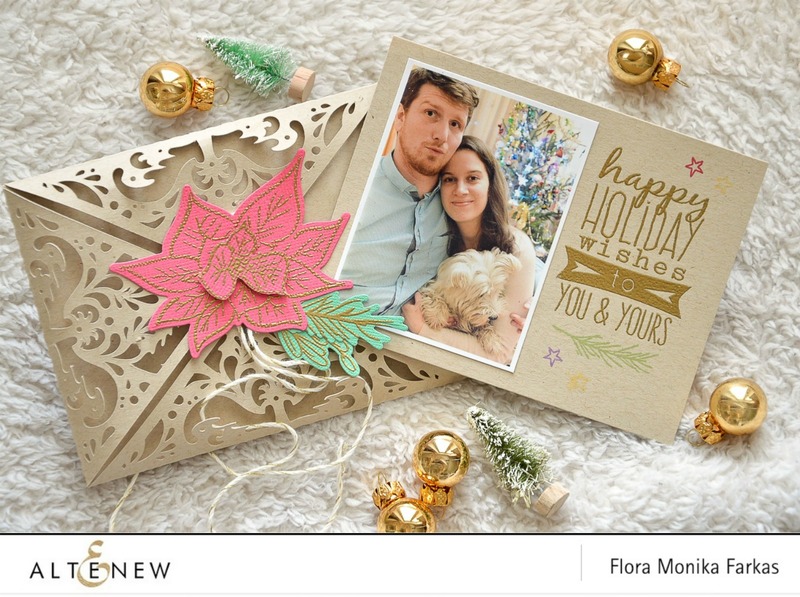 Love the poinsettia in gold embossing! I love the lacy envelope. Great photo and terrific way to showcase it. This is such a beautiful card design! Love the sweet photo! Love it. I don’t have the large die but it is beautiful. Thanks for sharing your card with us. What great way to seal your envelope with Altenew Poinsetta stamp and the wonderful sentiment with the photo. Really cute. A stunning card! Classy and elegant! Perfect for the photo! Such a beautiful card! I love receiving cards with photos but this really turns that into a gorgeous present! Huge wow! Lovely card – very special. Thanks!! What a delicate card. Thanks for the chance to win! Wow! These are beautiful and unique! Thank you for sharing your creativity! Such a beautiful way of wrapping the photo card. Love the lace envelope with poinsettia. THANK YOU for the inspiration! Printed photo cards are so popular for Christmas, I don’t know went I never thought of incorporating photos into handmade cards. Love your cards. Such beautiful work. Thanks so much for sharing!! This is gorgeous! What a great idea to add the poinsettia.